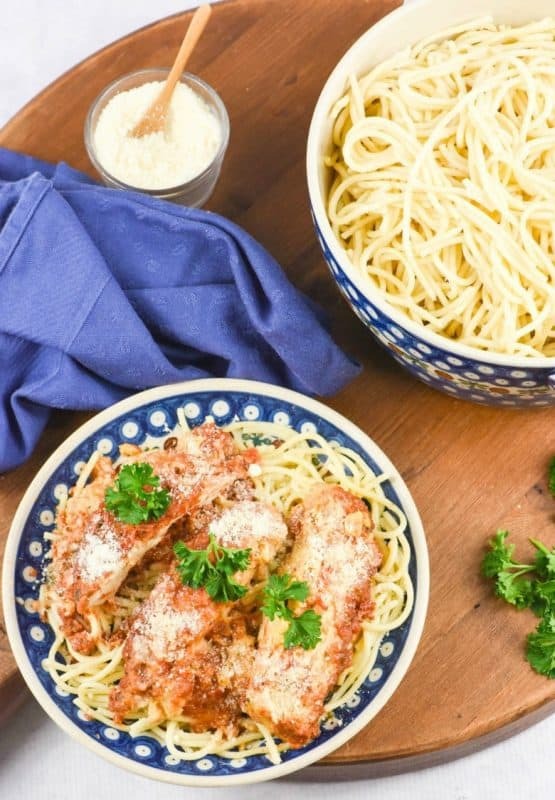 Easy Crock Pot Chicken Parmesan is just like the name says – easy! But, it is also delicious which makes it a winner of a family favorite! Pruning the vineyard is upon us and that means that for the next month, I will have very little time to spend in the kitchen! We’re all spending time outside in the fresh air, tending the vines and doing all the “outside work” that a vineyard entails. But that usually leads to less time for cooking. When it’s crunch time in the kitchen, I usually reach for two things: Chicken and my Crock Pot. Chicken is such a versatile meat. It’s inexpensive, and will usually take any spice you pair with it. It’s the basis of so many delicious meals and can act as a substitute for any meal you want to make a little lighter. As for my crockpot, how did I ever get along without one?? It’s a great tool for sorting out a dinner schedule and setting things in place whenever you need. When things get crazy around here, that’s when I bust out the crockpot. I actually have two crockpots – one crockpot is programmable and the other crockpot has a dial. I bought the second one because after years of use, the touch pad on the programmable one was beginning to be difficult to turn on. But, it is still working great and hasn’t died yet! Easy Crock Pot Chicken Parmesan is not only easy but it is delicious! We will definitely be having it this month. Because, when we are pruning, we work all morning, stop for lunch and a quick nap then continue pruning all afternoon until milking time. I stop before lunch to get it all ready and then ring our dinner bell to call everyone inside. During pruning, I don’t have time for complicated meals but I do want nutritious ones! 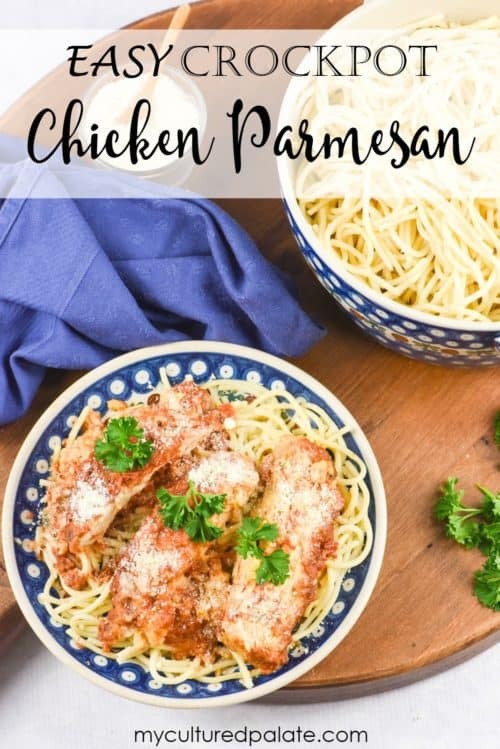 With Easy Crock Pot Chicken Parmesan, once the chicken is coated, all the ingredients are put into the crockpot and left to cook. I like to add spaghetti noodles and a salad to complete the meal. Don’t forget, with four boys that have big farm boy appetites and a couple of girls, hearty meals are a must! Especially when they have been working in the fresh air. Day #1: I serve the Easy Crock Pot Chicken Parmesan on a bed of spaghetti with a salad. Day #2: I cut the leftover chicken Parmesan into pieces. I add the chicken pieces and the leftover sauce (adding a bit more if necessary) to the necessary amount of spaghetti noodles. Adding more salad and muffins complete the meal! This can definitely be a one dish meal but with side dishes to along with it – let’s just say it stretches it for me so I have leftovers. Also, I should probably point out that a crockpot is different from an Instant Pot. These are two very different kitchen tools and while an Instant Pot can be used as a crockpot, I have not tried it and would love to hear if you do. 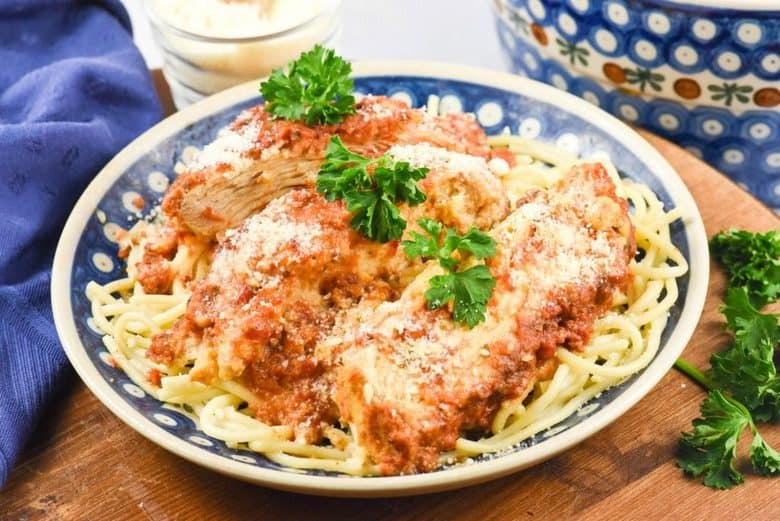 If you’ve tried this Crock Pot Chicken Parmesan recipe or any other recipe on Cultured Palate please take a minute to rate the recipe and leave a comment letting me know how you liked it. I love hearing from you! You can also FOLLOW ME on PINTEREST, FACEBOOK, INSTAGRAM, YouTube and TWITTER. Let the crockpot do all the hard work while you just boil pasta. Beat egg in shallow bowl with a fork. In another bowl combine the cheese and the bread crumbs. Dip the chicken in egg, then in the breadcrumb mixture - turn to coat well. Place in a 4 - 6 qt crock pot. Pour the tomato sauce over the chicken. Cover and cook on low for 4 hours. Serve with pasta if desired. This recipe doubled fits in a 6 qt crock pot. A crockpot is different from an Instant Pot. These are two very different kitchen tools and while an Instant Pot can be used as a crockpot, I have not tried it and would love to hear if you do. Dina-Marie, RN and founder of Cultured Palate has learned the importance of diet for health - the hard way! 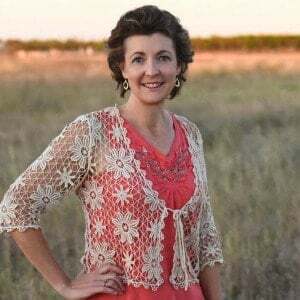 As the mom of 10, and leaving the corporate world to start a vineyard, she knows the value of simple living and you can too! Dina-Marie and Cultured Palate's medical advisors, Dr. Dalton and Dr. O'Connor, want you to have accurate information at your fingertips. I try to buy all my herbs, spices and real salt from Wilderness Family Naturals or Starwest Botanicals because they are organic, natural, and excellent quality. Doesn’t the breading get really soggy and slimey from sitting in the sauce and the broth? Jenny, it is not crunchy for sure but, the flavors blend giving a delicious result. My family loves it! I had no idea you could make this in a crock pot, can’t wait to try it! Lina, that sounds delicious – thanks for the tip!